I’ve had my heart broken. Tattered. Bruised. Taken advantage of. Betrayed. Haven’t we all at one time or another? Sometimes hearts are broken in a romantic relationship, but sometimes they are crushed by a friend, a parent, a child, a co-worker, a church, a job. Sometimes life balls up its fist and punches us in the chest through disease, disaster, financial storms, death. There’s literal pain, tossing and turning at night, tear-soaked pillows and those cycling thoughts that keep picking at a tender scar. We also have a Savior who is a healer, who is close to the brokenhearted. He knows our brokenness, our sorrows. My story Going Up South is about a woman who was betrayed by her husband. She meets a man who’s little boy heart was broken by his father, and now he feels deceived by one of his few friends. Though this is a romance, I hope, in my little story, you will find the One who truly binds up the brokenhearted. 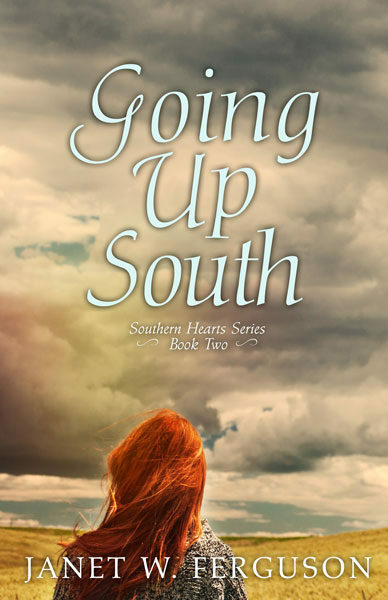 #Giveaway – Leave a comment by February 28th to be included in the drawing for an e-copy of Going Up South! This sounds like an interesting story- a very difficult situation for both H and h to be in! Always good to read books that are not afraid to tackle tricky, hard situations. Hi Wemble, Thank you! We do fall into tricky situations in life sometimes :) I hope you enjoy Going Up South if you read it. This story sounds intriguing. Yes, we’ve all been battered and bruised, but I am so thankful for our heavenly Father Who sees, hears, and lavished His love on us! Hi Kelly! Thank you for your interest! I love how you phrased that comment. He does see, hear, and lavish His love. Sometimes in the middle of hard things, we have to hang onto to that. This sounds like a book that will stay with me for days after I’ve read it. I love books that show God’s redeeming love. I look forward to reading it. Hi Marylin! I do love a book that sinks deep in my heart and mind. I hope you enjoy Going Up South. I will be adding this book to my list. We are so fortunate to know He is in our corner, I feel quite sorry for those facing these days and times without Him. Thankk you for being His messenger. Hi Joelle! Yes, what would I do without Him in my corner? I love that word picture. Thank you so much for your encouragement! This sounds like a great story! Love the cover! He bind up the brokenhearted-so true. Thank you, Sally! I think this is my favorite cover so far, too. Yes, He’s pieced my heart together many times. I can see the depth in this story already. Anyone with a broken heart can relate. And I think it’s even worse when your heart is broken by family. You can’t choose them and you’re stuck with them even if it hurts every time you see the one(s) who hurt you. I would say leaving is actually better for healing purposes, because having to deal with that person in a constant basis is like an opened wound that takes longer to heal. Hi Priscilla. Yes, I believe we’ve all been there one way or another. Family heartache is tough and unfortunately, it’s common. I guess it depends on the situation and God’s direction on how to deal with each situation. I sure do like to avoid conflict when possible. Sometimes I have no choice but to be there– hanging onto my Healer. This is going to bea tearjerker. There are so many questions a reader will want answer in this one. You may to tempted to be bias based on your own past but you have to choose to be able to see it from another point of view. Sometimes in the moment we may decisions that affect so many people similar to sin. There is a myth it only affects you but it affect everyone in your circle. Thank God for his grace and love. Hi! Thank you for commenting. You’re right. It is good to try and see things from another point of view, and our actions do ripple out to hurt others. We are all guilty, but for the grace of God. I hope you enjoy Going Up South! Love the cover! Sounds like a good read. Hi Beth! Thanks! The red hair makes the cover stand out, I think. The heroine has beautiful red hair in the story. I am captivated by the description of your novel. Although I have never read any of your books I would very much like to read this. Thank you so much, Linda! Those novel descriptions are really hard to write, so I appreciate your encouragement! You have an interesting title. Is that an expression I’m unaware of? Hi Merrillee, Going Up South is not really a saying but a tweak on the saying “going down South.” It makes more sense when you read the novel. It is set in the deep South of the U.S., but the characters end up making a trip to Central America. The novels are romantic comedy but they deal with tough issues. This book sound interesting. I have been wanting it ever since the first time I saw it. Thanks for the giveaway. I’m going through some “tough stuff” right now so I can certainly relate. This book sounds very interesting. I’d certainly enjoy the chance to read it. Thanks for the giveaway. Hi Gail, So sorry about your hard issues now. Those seem to drop on us unexpectedly sometimes. Prayed for you just now. I can relate…..tough health issues at present. This sounds like a book I MUST read! Jackie, So sorry about the health issues. Saying a prayer for you now. I hope you enjoy Going Up South. Hi, Janet! I’ve read all four books in your series, and they were all awesome. My absolute favorite was Tackling the Fields. I just really loved Cole and Audrey. Thanks so much for writing. I can’t wait to read your next book! Hi Meagan! Wow! I’m so humbled and honored that you enjoyed my little stories! That’s so encouraging :) Thank you! I better get to work finishing my next story! I love the idea of this book. Everyone deserves more than one chance and I love that this character wants to be better than his dad and wants to be a dad, not just a man who made a baby. These characters have difficult decisions to make and lots of heartbreak. I want to experience it right along with them. Hi Danielle! I love that name :) Thank the Good Lord we all get another chance. I hope you enjoy Going Up South. There are a few funny moments along the way, too. Kind of like life. Broken. Betrayed. Wow. You hit the nail on the head. What a great post. Hi LeAnne :) I’m so sorry you get. I wish we all had no clue about being brokenhearted. Thanks for commenting. Wow. It seems like it’s going to be an interesting story. Complicated too. I wanted to stop by and tell you how much I love Going UP South. It’s a great story! Hi Jackie! Thank you so much! You’ve been such a great support! Your book sounds really good and has a beautiful cover! Yes, life is full of heartaches & healing, or, at least, a lessening of the pain. Your book sounds interesting; I’d enjoy reading it, I’m sure! HI Laurel! Thank you! You’re right, and my New Year’s resolution is to find joy in small things no matter the situation. I hope you like the Going Up South! Hi Teri! Your sister would make a great heroine! I hope you like Going Up South! This sounds like a great read. There are just times that a heartbreaking story is what I need to read. This sounds like it definitely fits that category. I hope you like Going Up South. Going Up South sounds like a great read! I loved this story and it’s broken hero and heroine. A great read! Marion, You helped make it a better story! Thanks for such a great reminder, Janet. And I love this book! Real life stories are needed for those who are hurting. So thankful for the hope it brings. Thanks for the encouragement, Susanne! I hope you like Going Up South. I love stories that have real life issues. They help us feel we are not alone. The book sounds amazing. Thank you, Deana! You are right. We are not alone :) I hope you enjoy Going Up South. don’t enter me as I’ve already got a copy of this beautiful book :) but I just wanted to say how much I loved this post! This sounds like a very good story with a lot of twists to it! I would like to read it. Kimberly, I love that passage as well. Each of the 4 books in this series uses part of it as a theme verse. Leaving Oxford uses “beauty for ashes,” Going Up South uses “He binds up the brokenhearted,” Tacking the Fields uses “He frees the captives,” and Blown Together use “They shall be oaks of righteousness, a planting of the LORD.” I hope you like the stories!! I love books about true-to-life people. Sometimes the characters are just way too perfect to relate to. I happen to know a family where the father found out he had a son who was already about 7 years old. This book is going on my TBR list. Hi Sherri! Yes, I cannot relate to perfect :) I hope you enjoy Going Up South! Sounds like a book with depth and grit. Some heartbreak takes a long time to heal, but God is faithful. Thanks, Lucy! Heartbreak does take a some time. Yes, we have to hang onto His faithfulness. You’re so right!